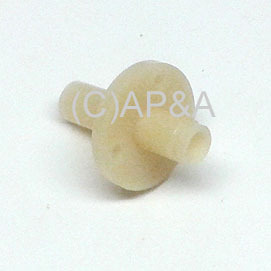 Nylon flipper shaft bushing for Williams games approx. 1965-1979. Also fits Atari games. This bushing acts as a guide/support for the flipper shaft that goes up through it. Fits over existing studs in playfield wood on Williams games and uses nylock nuts to secure. Mounts to metal flipper baseplate on Atari games and uses our fliper bushing nut/screw set to secure.